When the news about Prime Minister K P Oli’s proposed India visit hit the news headlines, the leaders of the two parties have started making a haste to unify the two communist parties—CPN-UML and the Maoist-Centre before the visit. However, there have been contradictory views regarding the haste shown by the leaders of both the parties for the unification. Earlier, the leaders had decided to formally unify their parties on April 22, the day when Nepal Communist Party was established. Some said Prime Minister Oli wants unification earlier because he wants to pay visit to India as a powerful Prime Minister while the Maoist leaders fear the unification process may face problem once Oli meets the Indian leaders. Although the Maoist leaders have denied this fear, most of them fear whether India will advise PM Oli to postpone the unification with the Maoists. 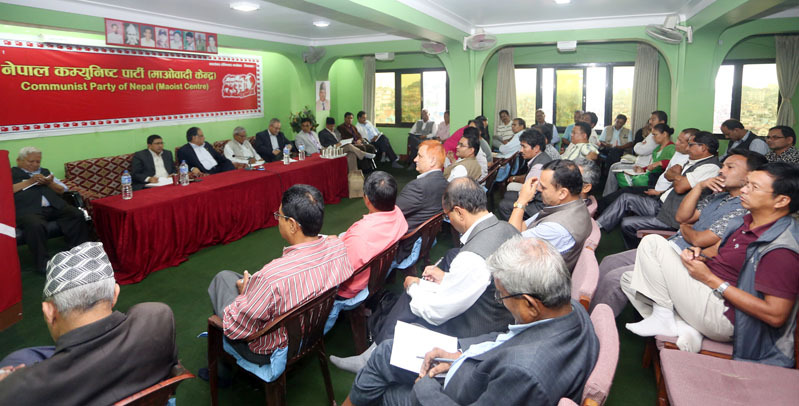 Earlier, on Saturday, a headquarters meeting of the CPN-Maoist Centre had decided to devote effort towards completing the preparations for announcing party merger with the CPN-UML before Prime Minister KP Sharma Oli’s planned visit to India in the first week of April. Maoist leaders said party chairman Pushpa Kamal Dahal presented the proposal of an early merger in Saturday’s meeting. As PM Oli wished to make his maiden foreign trip as the head of a unified communist party, the Maoist meeting decided to complete all the pending works at the earliest so as to ensure the announcement before the visit. The developments, as claimed by leaders from both parties, are significant as it would be easier for the prime minister to deal with foreign countries in a stronger position. Leaders involved in the unification bid said all the works on the UML side are almost over while the Maoist Centre still has some tasks such as fixing the number of its major executive committees to complete. The Maoist Centre has called a meeting of its secretariat for Thursday for giving the party committees their concrete shape. However, contrary to the preparations being made to unify the two parties, chairman Dahal on Monday said that the unification would not be made in haste as reported in the media. He also argued that he would not be ready to unify his party on the basis of power sharing of 70/30. “Maoist-Centre will be unified with the UML on the basis of equality, there will not be 60/40 share, he said while speaking at a training for the student wings of his party. Dahal’s expression clearly suggested the growing bargaining power of the Maoist Centre as the unification date delayed. His views made public when PM Oil had proposed to unify their parties before April 6 look meaningful.